Japan, the land of the rising sun, a place that truly feels like a whole different world sticks to that notion with their latest advertising idea of armpit ad space, along with the neon lights of Shibuya’s zebra crossing, the radioactive fallout from Fukushima, and the rumours of used women’s underwear being sold from vending machines. 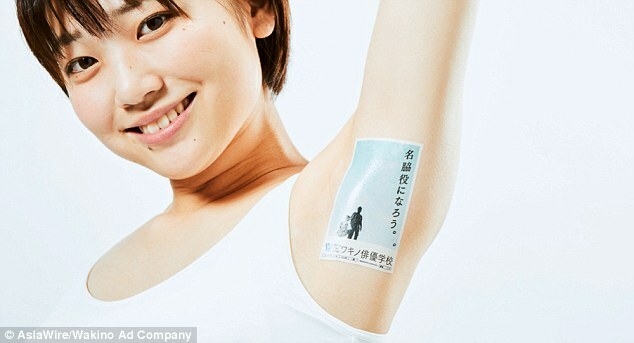 Armpit advertising space might not be that strange, after all, the Wakino Ad Company takes its name from ‘Waki’, meaning ‘armpit’ in Japanese, and they’re not wasting any time getting their ideas out there after claiming to have found the hottest space for placing the adverts for their clients. Yes, and they’re paying young models ¥10,000 (£68.60) an hour for armpit exposure of various brands. Togech reported that beauty treatment centre Seishin Biyo Clinic has already hired the services of an armpit model. Their product, ironically enough, is a painless underarm hair removal product. Other brands are now stepping up to the plate and putting their money where these armpits are to cash in on this hot new advertising trend. You’ll also be happy to know that Wakino are currently recruiting men and women to model, in search of who has the best looking armpit via applications to the National Waki Beauty Contest, to finally determine who has the most beautiful underarms. The applying contestants are asked to provide links to their social media pages as another platform to promote business for the brands. Wakino is owned by beauty firm Liberta, that also markets cream for the improvement of armpit appearance. Japan is no stranger to bizarre advertising space. In 2013, the thighs of girls were used to promote Green Day’s album ‘!Uno!’; a strategy that involved the band and PR company Absolute Territory. That campaign used girls aged over 18-years old to display the album sleeve image in the gap between their knee socks and the hem of their mini skirts. Nice! For all things cutting edge and a bit strange, Japan definitely seems like the place for a trial advertising campaign involving armpits.